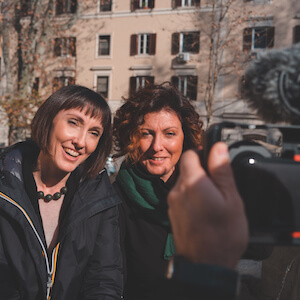 In the first of our new video series which will delve into the most delicious parts of Roman cuisine, Local Aromas co-founders Benedetta and Valeria take a look at Rome’s iconic pizza by the slice. Priced and sold by weight, pizza al taglio is without a doubt the Romans’ favorite street food, as well as being a quick, inexpensive, and satisfying mid-morning snack or lunch on-the-go. Watch as our very own Foodie Sisters hit some of the best pizza by the slice joints in Rome to explain the difference between pizza alla pala and pizza in teglia, and show you how to choose, order and, most importantly eat, this unmissable Roman delicacy. Find out all about Roman pizza by the slice in the first of our new video series. Follow Local Aromas co-founders Benedetta and Valeria as they explain everything you need to know about pizza al taglio.